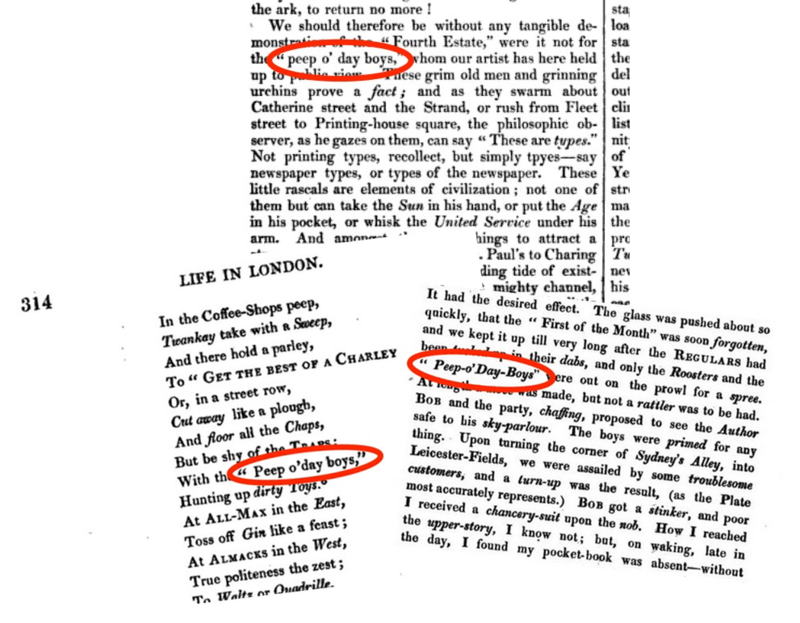 I’d first happened upon the Peep o’ Day Boys as scarcely more than a simple mention in The English Spy (1825) by Bernard Blackmantle (pseudonym of Charles Molloy Westmacott) and in Pierce Egan’s Life in London (1821). Who might they have been? 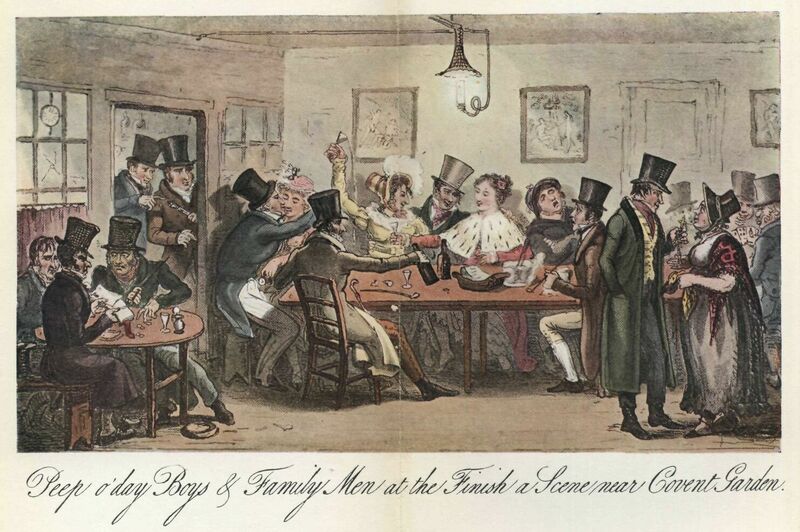 A quick search of Wikipedia turned up only “an agrarian Protestant association in 18th century Ireland” which, it seemed to me, was unlikely to have any connection with the London gentleman carousing in the illustration, above, from Blackmantle’s book. The ‘Finish’ mentioned in the legend beneath the picture, by the way, appears to have been a Covent Garden coffee house, previously Carpenter’s Coffee House, established some time around 1762. A broader web search for the Peep o’ Day Boys again seemed to draw blanks. Top: The London Saturday journal, 5 June 1841; bottom, left and right: Pierce Egan, Life in London. And Tat’s men, deep he’d play. Peep-o’-day boy, subs. phr. (old). —A street roister [Regency]. 1821. Egan, Life in London, n. vi. Jerry and Bobby, . . . With the Peep-o’day boys, Hunting after wild joys. Bells Life in London and Sporting Chronicle for 2nd August 1857 mentions a “Peep o’ Day Boy” as the name of a racehorse. But this some thirty-odd years later, indicative of no more than the durability of the name. And that’s as much as I’ve been able to find. If any reader of this blog knows more, I should be delighted to hear from you. Egan, Pierce. (1821). Life in London. London: John Camden Hotten. Westmacott, Charles Molloy. (1823). Points of misery; or Fables for mankind. London: Sherwood, Jones & Co.
Blackmantle, Bernard. (1825). The English Spy. London: Sherwood, Jones & Co.
Sala, George Augustus. (1859). Twice Round the Clock, or The Hours of the Day and Night in London. London: Houlston & Wright. Wright, Thomas. (1867). Some Habits and Customs of the Working Classes. London: Tinsley Brothers. Farmer, John Stephen & William Ernest Henley (eds). (1902). Slang & Its Analogues Vol. 5. London: Printed for subscribers only.